'It was the summer that Coltrane died. The summer Jimi Hendrix set his guitar in flames and China exploded the H-bomb. There were riots in Newark and marches against the war in Vietnam. The world was on the brink of change. It was the summer of love. And the summer of a chance encounter that would change the course of my life. It was the summer I met Robert.' Just Kids is the story of two innocents who shed sheltered lives and braved the city in search of art and freedom. In each other Robert Mapplethorpe and Patti Smith found kindred spirits and pursued their mutual dreams, from Brooklyn to the Chelsea Hotel into the world. Each would eventually reach the pinnacle of artistic achievement and their vow to always care for one another survived painful trials and separations. Mapplethorpe's unforgettable portrait of Smith for the cover of Horses forever fuses their indelible mark on our culture. 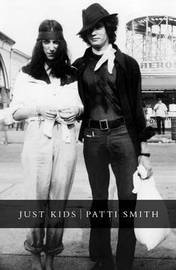 Intimate and broadly evocative of New York in the early 70s, Just Kids - part romance, part elegy - is finally about friendship in the truest sense, and the artist's calling. Patti Smith is a writer, artist and performer. She has recorded ten albums and written five books, and her artwork has been exhibited worldwide. In 2005 she received the Commandeur de l'Ordre des Arts et des Lettres, the highest grade awarded by the French Republic to eminent artists and writers who have contributed significantly to furthering the arts throughout the world. She lives in New York City.